1 Organic Vitamin B17 Pro950 100 Vegetarian Capsules containing 475mgs of Pure 99.99% B17 and 475mg's of 100% Pure Apricot Kernel Extract per Capsule equaling 950mg's per capsule. Total of 100 Capsules Per Jar. 1 Organic Monolaurin Professional ; Contains 99.99% Pure Monolaurin Derived from Organic Coconuts, 200 Vegetarian Capsules per Jar 600mg's Each. 1 Organic Graviola Professional 20:1 meaning 20 X stronger than the leading brand of Soursop/Graviola. 120 Vegetarian Capsules Per jar. 1 Sicarius Professional (Sicarius Means The Killer), A Broad Spectrum Anti "Bad Organism Killer" containing 4 Powerful Ingredients Potentised and Powerful, contains 120 Vegetarian Capsules Per Jar. All ingredients are organic and potent. 1 Inhibitor Professional (Inhibitor meaning to Inhibit the Growth of Bad Organisms such as Viruses, bacteria, etc) contains 4 Powerful Ingredients, 200 Vegetarian Capsules Per Jar. 1 Interfector ( Interfector meaning "To Eat and Disrupt" the formation of Lipid Protein Shields that guard viruses ), works best with Monolaurin, 120 Veggie or Gel Capsules per Jar containing 100% pure Bht. 1 Zeolite 2 which contains 2 power house broad spectrum ingredients with many advantages, these ingredients are 100% Pure Miconized Human Grade Zeolite and Potentised (Concentrated) Pure Humic Acid Professional. 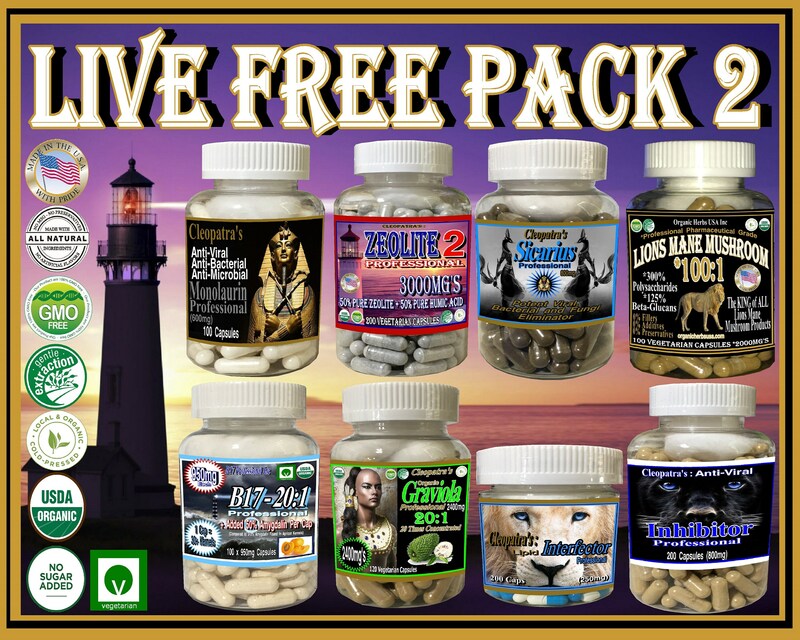 1 Lions Mane Mushroom (The King of All Lions Mane Mushroom Products) Concentrated to a level of 100:1 meaning just 1 Vegetarian Capsule is equal to 100 capsules of the competitors. Great for the Brain and Immune Function.